Celtic romped to a 5-0 win over St Johnstone on Sunday and one player who had to look on from their place on the bench was Mikael Lustig. The right-back was amongst the substitutes for the rout, but the performance of on loan defender Jeremy Toljan will certainly have him quaking in his boots. Toljan is on loan from Borussia Dortmund and he definitely impressed in the absence of the Swedish enforcer, and this is no doubt a cause for concern for Lustig. The 24-year-old posed a real threat down the right-hand side and proved to be a menace with his constant runs, something which was epitomised in the second half of the thrashing – and Brendan Rodgers will no doubt be thinking very carefully whether to continue to place his trust in Toljan. Why wouldn’t he? He has performed admirably when called upon and he is a much better option than Lustig, who at times can often be a bit of a liability. The German defender offers a new dimension to the Hoops and is exactly the boost they needed to win the race for the title this season. 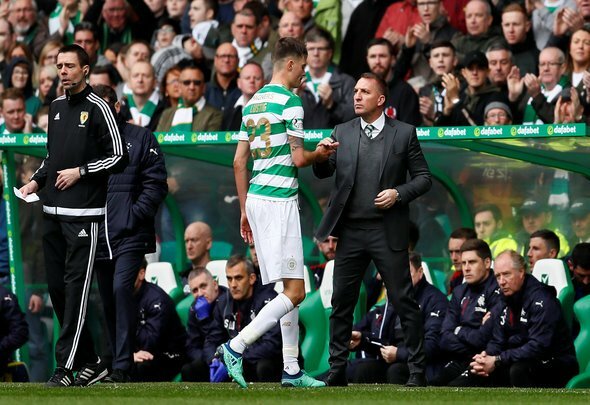 Mainstay Lustig – who has 19 Scottish Premiership appearances this season – has never been a favourite among the fans, so perhaps it is about time that Rodgers favoured someone else? Toljan is just that player, and his ability is something that will have Lustig very worried indeed. Not only does he possess the skill of pushing forward and contributing towards the attack, he is also very solid defensively and it takes a lot to beat him. He is only going to get better and better – much to the dismay of Lustig – something which will have plenty of supporters drooling. Either way, Lustig’s days at Parkhead are looking increasingly numbered now Toljan has come in and turned heads.